The Internet has been the great enabler. Websites and Blogs have enabled anybody to be a writer and a publisher. YouTube has enabled anybody to be a star/producer/director. And eBay has given you and me the ability to be a merchant and to sell our wares to the world. The term, e-commerce refers to business conducted on the web. Amazon.com was one of the very first companies to figure out how to make money selling on the web. At first Amazon just sold books. Anybody, anywhere could purchase a wide selection of books, even if there was no bookstore for hundreds of miles. And the book business has been changed forever. Today, Amazon is still way out in front of the curve. If it exists, you can buy it on Amazon.com! A new generation of e-commerce websites and widgets are about to enable you and me to become e-merchants. We may not make it as big as Jeff Bezos, the founder of Amazon.com, but hey, you never know! In this Special Edition Workbook, we’ll examine some of these options that are no farther away than the Designs Gallery in Xara Web Designer Premium 7 and Xara Designer Pro 7. Open the Designs Gallery and then open the Widgets > E-commerce Widgets folder. There are some familiar names like PayPal and Google and some that may not be as familiar such as ecwid and Wazala! If you’re like me you just said Wazala! What’s that? Well it’s a brand new e-commerce solution from some clever folks in Los Angeles. We’ll talk about it in moment and all will be revealed. You can drag any of these widgets onto the screen and a window will open, which I regret to say, more often than not creates more confusion than solutions. But it is a catalog of many of the options that exist for us e-entrepreneurs. PayPal has a new beta widget that is very easy to use. 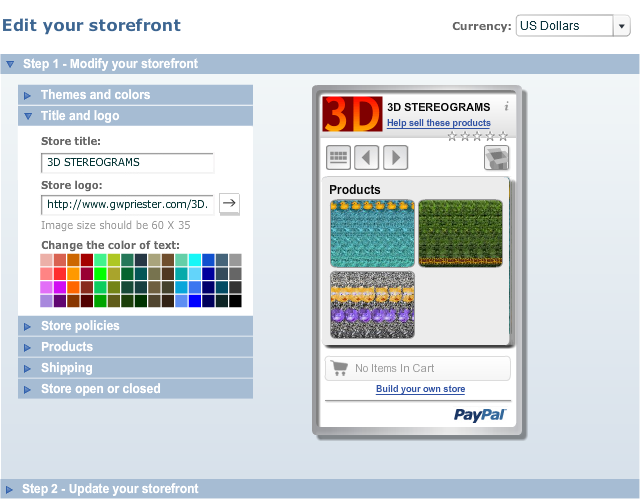 We’ll look at PayPal Xilab Storefront first. After a bit of fiddling around, I have decided that it is best to go directly to the PayPal website. 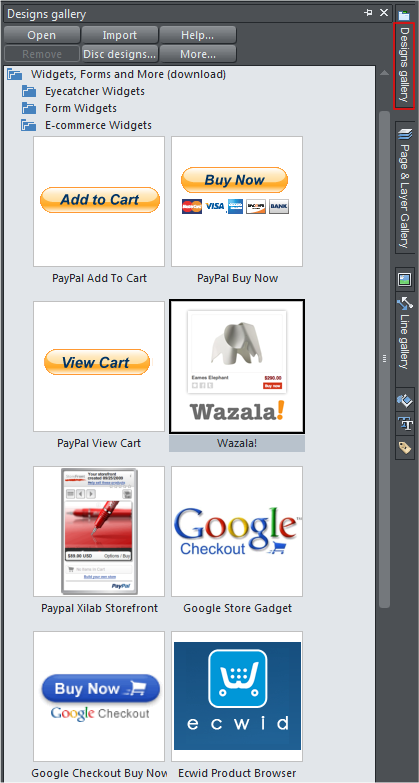 So go here http://storefront.paypallabs.com/ for the PayPal Xilab Widget. 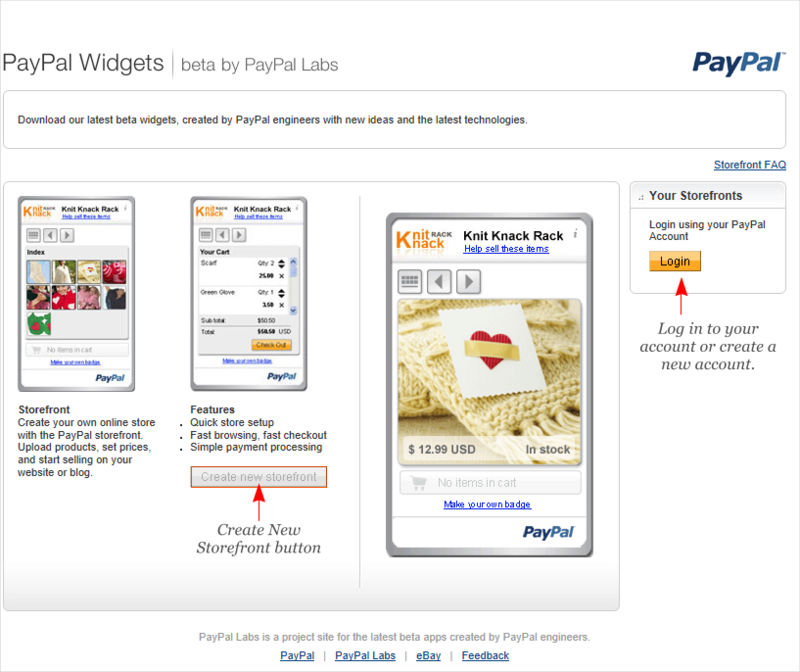 The PayPal Widgets website is shown above. The first thing you need to do is to log in to your PayPal account. You must have a PayPal account to go any further. Luckily I do. I only use my account to send invoices but it’s all I need to sign in and get started. After you have signed into your account you will see essentially the same screen as above, except the Create New Storefront button will be enabled. If you have already set up a storefront, it will be listed where the login button is shown above on the right and you can select it and edit your widget as needed. Once you are inside you can set up your storefront. The menu on the left lets you specify a Store Title, add a small logo, and add some small photos of your products. You can add Store Policies, add products, add inventory numbers for each product, establish shipping, though as always with PayPal it can only be based on the purchase amount. And you can indicate if your store is open or closed. 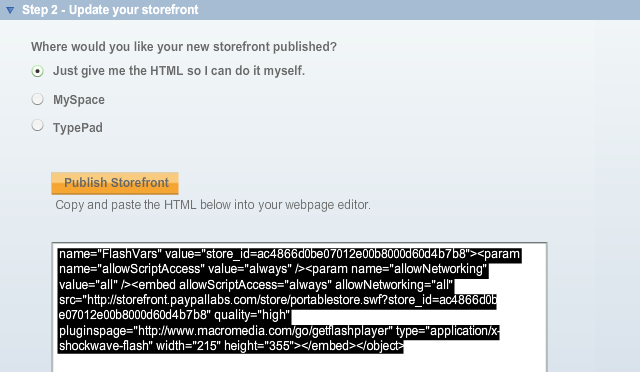 Once you are done you will be prompted in Step 2 to Publish Your Storefront or in my case, to Update Your Storefront. The widget is updated as you make changes. At present the PayPal Storefront does not let you upload images, so you need to post your images somewhere where PayPal can fetch them. You can use your own website or any of the web based photo galleries. 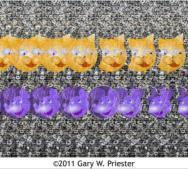 Just locate the image in your web browser, right click on the image and select Copy Image Location. Paste the URL in the address dialog box. Product images have to be 188 x 168 pixels. Your logo can only be 60 x 35 pixels. The actual sizes are shown with the images below. These logo and product pictures are posted on my website and then linked to from the widget. 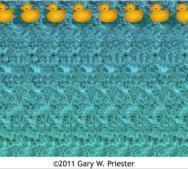 For example, www.gwpriester.com/Rubber- Ducky.jpg is the link I submitted to display the Rubber Ducky image. When you publish your Storefront, you are given three options. Pick the first, Give me the HTML. Copy the script and add it to a placeholder and you are good to go. A placeholder if you are a new user is a simple rectangle. With the rectangle selected, open the Website Properties > Placeholder menu and click HTML code (body), paste the script, press OK and then press Apply. The image below shows the pasted script. And here is my Storefront. 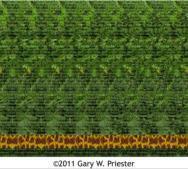 I removed the inventory just in case you felt compelled to purchase one of my 20” x 16” stereogram prints (they don’t exist). The beauty of this system is the PayPal back end is already in place. So everything else is taken care of when your visitor makes a purchase. I left one Rubber Duckie print so you can see the other options such as shipping, etc. Please don’t buy it. I added the code shown above to a 216 x 350 pixel placeholder. You see the actual working strorefront. CLICK HERE TO DOWNLOAD YOUR FREE TRIAL COPY OF XARA DESIGNER PRO 7 CLICK HERE TO DOWNLOAD YOUR FREE TRIAL COPY OF XARA WEB DESIGNER PREMIUM 7 TIP: I’m used to creating placeholders, but there really is a simpler (and more effective) way. 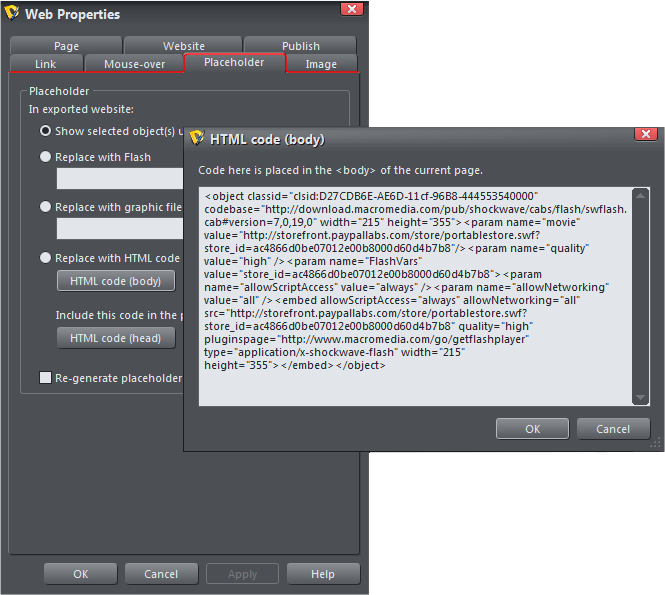 Simply copy the script to the clipboard, then right click on the page and select Paste > Paste HTML Placeholder. Instead of a non-nondescript rectangle, when you Paste HTML Placeholder shows the actual object as you see it in the browser. From within the Xara Create New Widget’s window, you can copy the script, then click Insert. Now I just need to remember this!